This is a costume I made all on my own and for myself. I like trying new things and decided I would learn how to use a sewing machine. This was my first attempt at using a sewing machine and I made the costume with a hand drawn pattern I made based on looking at a picture of the movie character. 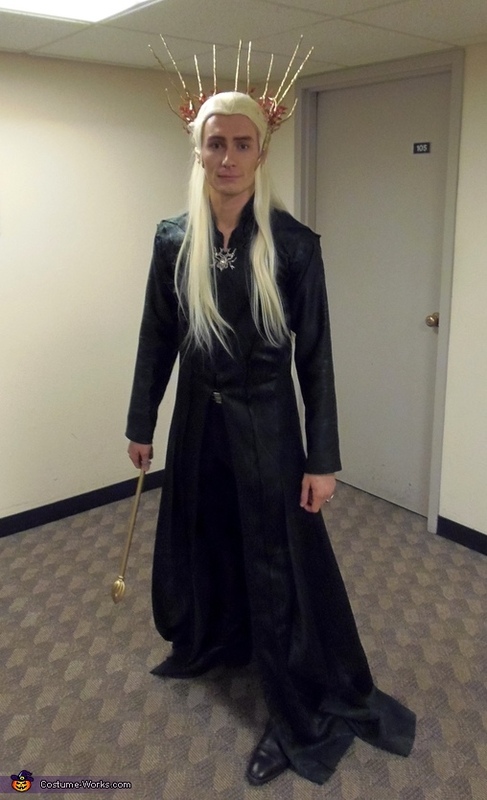 I am also a Lord of the Rings and Hobbit fan and I like the elves in this series. I made the entire robe, the crown, the rings, and the scepter by hand. The pants are black slacks, the wig and brooch was purchased online, and the boots are my horse riding boots that happen to fit the character. The crown is made from a wire coat hanger base twisted into shape and then covered with Model Magic and spray painted. The rings are made from recycled Halloween spider decorations. I am a full time graduate student who enjoys DIY projects whenever I can manage to find a bit of spare time. This is also my first costume contest I have entered.